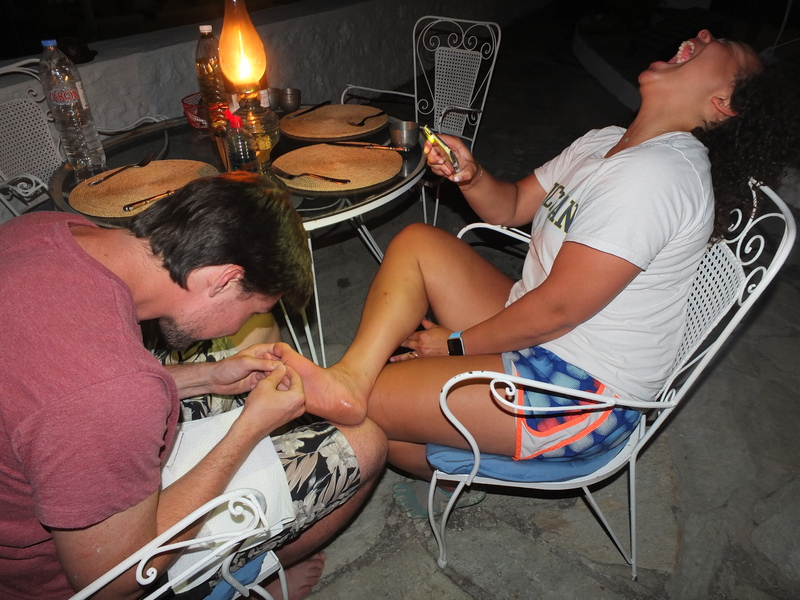 Five Days/Five Greek Photos Day 4: Ouch! So, some might say its a Greek initiation. (However, I have– unbelievably– been able to avoid it over the last 30 years.) The sea urchin injury claims almost everyone at some point or another…and it hurts! The spines are very brittle and break off easily into the careless swimmer’s foot. And unlike, say, a thorn or a splinter of wood, the spines have no structural integrity, and cannot hold together through the extraction process. They break off or flake away in pieces, leaving the tip of the spine hopelessly buried in the skin. As you walk, the spines press down painfully and there’s nothing you can do except wait for the body to push them out. Fluid builds up around the remains of the each spine, pushing the black implants back up to the skin’s surface. Ten days later, you have your foot back. Tread carefully if you don’t want the majority of your vacation compromised! You mean drink it and forget the pain?! Ouch indeed! Sounds awful. Reminds me a bit of the blue bottle stings you can get swimming in Australia. Aaaargh! That’s the reaction I had when I saw the picture … and then read the post. Yes. Trying to get them out was a futile and painful operation!